At 6:45 a.m., Cy Goldsbie spotted a guy spraypainting this message on both of Spadina station’s Spadina-immediately-north-of-bloor entrances and was kind enough to snap these pics for us. TTC labour issues and graffiti, together again at last. 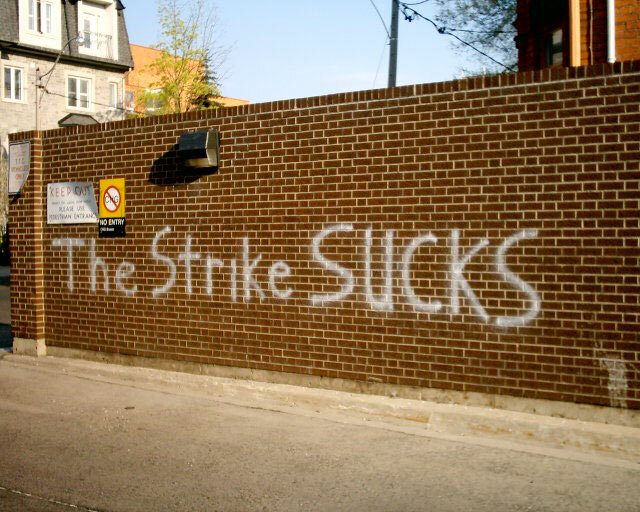 Filed under Cy Goldsbie, Spadina Road, Spadina station, ttc strike, discovery, graffiti, news, transit, TTC, Vandals!